The LXHL-MW1B has been discontinued. Our SP-01-W5 may be a suitable replacement. The LXHL-MW1B White Luxeon® Star/C consists of a Luxeon Emitter mounted to a square aluminum submount that includes an AMP connector and 2 mounting holes. 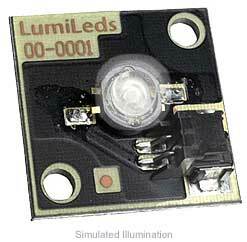 This product is specifically designed to be used in your own integrated lighting solutions.